By now, most people have become aware of tungsten rings. 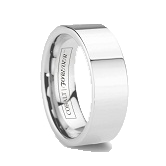 They know tungsten rings and tungsten wedding bands for their extreme scratch resistance, durability and unique designer-style, and that they have become the best option for men and women looking for a ring or wedding band tough enough for every day wear. 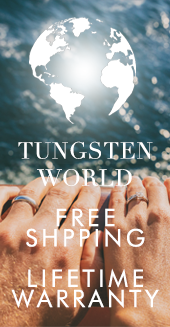 Here at Tungsten World, we only sell the highest quality Tungsten Forever™ tungsten carbide rings, and on our site, you will see us use the words “tungsten” and “tungsten carbide” frequently. For all intents and purposes, we use these words fairly interchangeably for description purposes, but as related as the two terms are, a difference between tungsten carbide vs. tungsten rings does exist. 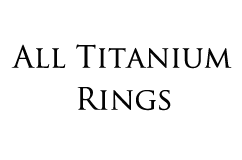 Essentially, the main differentiation between tungsten vs. tungsten carbide is the fact that one is an element and the other an alloy. 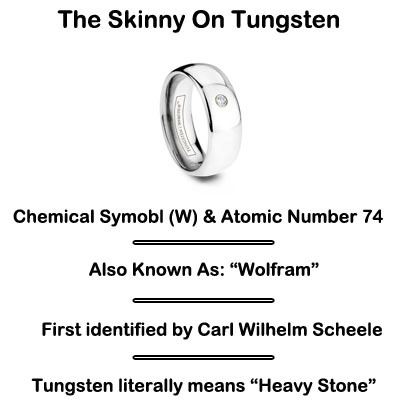 Tungsten is element 74 on the periodic table and is known for its dark-grey color, high density and hardness. 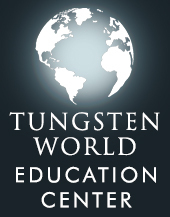 However, tungsten is difficult to work with in its elemental state. Tungsten carbide is an alloy of elements including tungsten, nickel, tantalum, niobium, titanium and chromium. 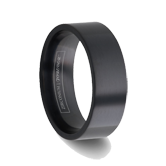 High quality tungsten carbide, like that used in our Tungsten Forever™ tungsten rings, is composed with a large percentage of tungsten, giving the alloy the inherent hardness and dark-grey color tungsten implies. By adding the other trace metals, the benefits of tungsten are maximized, and the resulting metal is able to be better worked into the many unique styles found on our site. 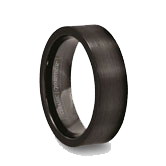 Whether listed as “tungsten” vs. “tungsten carbide” rings, all the rings found on our site are, in fact, tungsten carbide rings. As stated earlier, we use the words interchangeably. But what does not change is the quality of our Tungsten Forever™ tungsten rings and tungsten jewelry. 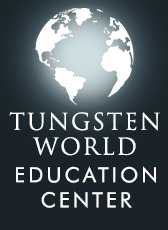 All our products are the highest quality tungsten carbide and backed by the industry-leading policies and warranties of Tungsten World. 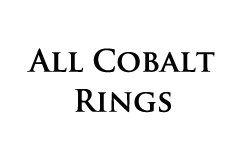 So, whether you want to call them tungsten rings vs. tungsten carbide rings, if you’re shopping with Tungsten World you’ll be getting the very best tungsten carbide products on the planet!